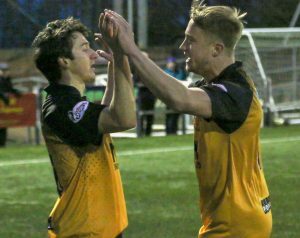 Annan Athletic’s push for one of the promotion play off places continued on Saturday with an excellent victory over Cowdenbeath. Annan had to do it the hard way coming back from behind twice culminating in a competent second half performace which saw Annan take control of the match but they had to wait patiently with the decisive moment coming in the 86th minute followed by a fourth goal deep into injury time. Manager Peter Murphy made one change with Christain Nade being given a starting place for the injured Tommy Muir. Annan got off to the worst possible start after Scott Hooper conceded a free kick 30 yards out and Fraser Mullen dispatched the free kick into Mitchells top left hand corner to give his team the early advantage. It was a blow to Annan who had started promisingly. Annan responded in the 15th minute when Chris Johnston scored a glorious individual goal cutting in from the right wing to finish with a glorious 20 yard effort from outside the box which went over the head of keeper Aaron Lennox and into the net. Tony Wallace tried his luck with a shot from outside the box but the spectacular effort went high and wide. Annan were creating scoring opportunities after Watson’s header went close and David Wilsons effort was blocked. The play switched to the other end and the dangerous Kris Renton tried his luck with a shot into the arms of Mitchell. Then in the 35th minute Cowdenbeath cut open the Annan defence with a good move down the centre ending with Kris Renton hitting an unstoppable shot into the net from 12 yards. Annan finished the half looking for the equaliser, Watsons header from a corner was dealt with by keeper Lennox. Moxon then on the stroke of half time let rip from the edge of the box only for the shot to go over the bar. At the start of the second half Murphy introduced Lewis Strapp in place of the injured James Creanney. Annan squared the match for the second time in the 56th minute. The goal was created down the left when Lewis Strapp’s cross was headed on by Moxon into the path of Chris Johnston who’s looping header over the stranded Lennox gave the keeper no chance. The goal gave Annan the impetus to push forward, Nade saw his header cleared off the goal line from a Chris Johnston corner kick. The introduction of Ross Ferguson in the 68th minute for Nade gave Annan an new dimension and minutes later Aidan Smith hit the cross bar with a header from Ferguson’s cross. Cowdenbeath made a host of substitutions with Gary Fraser and Jordan Allen and David McGurn replacing the injured keeper Lennox in the 76th minute as Gary Bollan endeavoured to bring his team back into the match. Annan introduced Kyle Bradley for Tony Wallace and in the 86th minute Annan struck gold when Chris Johnston connected with Aidan Smiths header to volley the ball into the net from 10 yards. It was a goal which had been on the cards for a while, Cowdenbeath then had Luc Bollan sent off in injury time and Annan had the final say when Ross Ferguson picked out Aidan Smith who’s header found the corner of the net from close range. It was another three points for Annan who are on a good run at the moment and with a third of the season still to play we are well placed to make a push for the fourth play off place with Edinburgh City, Peterhead and Clyde looking like they can only throw away the advantage already created. But with 36 points still to be played for nothing is certain. Cowdenbeath – Aaron Lennox ( David McGurn 76 min), Fraser Mullan, Luc Bollan, Jamie Piper, Jamie Todd, Blair Malcome , Kyle Miller, Martin Scott ( Gary Fraser 70 min ), Robbie Buchanan, David Cox ( Jordan Allan 80 min) , Chris Renton . Subs not used Harvey Swann,Mathew Henvey, Kyle Sneddon. Peterhead took advantage of Edinburgh Citys Challenge Cup semi final down at Wales, City went ahead early on against Connahr Quay Nomads who equalized mid way through the first half. There was no further scoring in full time and the teams had to be separated by penalties in the shoot out which The Welsh team won 4-3. Peterhead defeated Queens Park 2-1 and are now only a point behind Edinburgh City with a game in hand. Elgin City scored 2 late goals to take the match away from Stirling Albion to win 3-2 and push them back into the promotion race. Albion Rovers lost out 1-0 at Broadwood to keep Clyde in with a great chance of winning the title. Annans next matches are Albion Rovers at home next Saturday followed by a Tuesday night trip to Berwick then another home match against Queens Park.